The movement toward greater openness represents a change of philosophy, ethos, and government and a set of interrelated and complex changes that transform markets altering the modes of production and consumption, ushering in a new era based on the values of openness: an ethic of sharing and peer-to-peer collaboration enabled through new architectures of participation. These changes indicate a broader shift from the underlying industrial mode of production—a “productionist” metaphysics—to a postindustrial mode of consumption as use, reuse, and modification where new logics of social media structure different patterns of cultural consumption and symbolic analysis becomes a habitual and daily creative activity. The economics of openness constructs a new language of “presuming” and “produsage” in order to capture the open participation, collective co-creativity, communal evaluation, and commons-based production of social and public goods. Information is the vital element in the “new” politics and economy that links space, knowledge, and capital in networked practices and freedom is the essential ingredient in this equation if these network practices are to develop or transform themselves into 'knowledge cultures'. <i>The Virtues of Openness</i> investigates the social processes and policies that foster openness as an overriding educational value evidenced in the growth of open source, open access, and open education and their convergences that characterize global knowledge communities. The book argues that openness seems also to suggest political transparency and the norms of open inquiry, indeed, even democracy itself as both the basis of the logic of inquiry and the dissemination of its results. 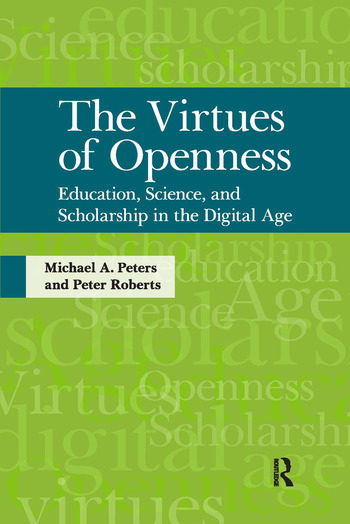 <br><i>The Virtues of Openness</i> examines the complex history of the concept of the open society before beginning a systematic investigation of openness in relation to the book, the “open text” and the written word. These changes are discussed in relation to the development of new open spaces of scholarship with their impact upon open journal systems, open peer review, open science, and the open global digital economy.